Quantitative descriptions of biological processes are one of the main activities in Life Science research, whether in physiology, biochemistry or molecular and cellular biology. They offer a way of characterising biological systems, measuring subtle effects of perturbations, discriminating between alternative hypotheses, making and testing predictions, and following changes over time. There can be many different ways to describe the same biological process. Phenomenological descriptions provide a way of relating input and outcome of a given process, without requiring a detailed knowledge about the nature of the process or possible intermediate steps. Since they provide a direct link between input and output, they can be easily applied to experimental results. On the other hand, Systems Biology favours more mechanistic representations, that aim at exploring how exactly behaviours of systems emerge from intrinsic properties and interactions of elements at a lower level. Using the former descriptions to build and validate the latter representations may prove a challenge in some cases. Several types of descriptions may co-exist for a given biological problem. One of these problems is the binding of ligand to a protein with several binding sites, and the apparent cooperativity observed in this context, for which various frameworks have been developed throughout the XXth century . where K denotes an apparent association constant, [X] denotes ligand concentration, and n H the "Hill coefficient", intended to be a measure of cooperativity. where [X] denotes ligand concentration, and with K R , L and c as described in the paragraph above. In this paper, we first propose a generalised MWC framework that can be applied to proteins whose ligand binding sites have different affnities. We then develop a set of equations that uses the parameters of such a generalised MWC model to compute apparent association constants according to the Adair-Klotz model. We show how these can be used in order to compare model results with experimental data using two examples which constitute extreme cases of the general framework, calmodulin and hemoglobin. The MWC model can be adapted to describe a protein (whether oligomeric or monomeric) with several ligand binding sites possessing different affinities. In that case, microscopic association constants are termed and , and their ratio is denoted by c i for the i th binding site. where 1 ≤ i, j ≤ n, and L and [X] as described above. where 1 ≤ i, j ≤ k, m i denotes the number of binding sites with affnity (note that Σ i m i = n), and L, c i and [X] as described above. When all and all c i are equal, this corresponds to the original MWC equation . 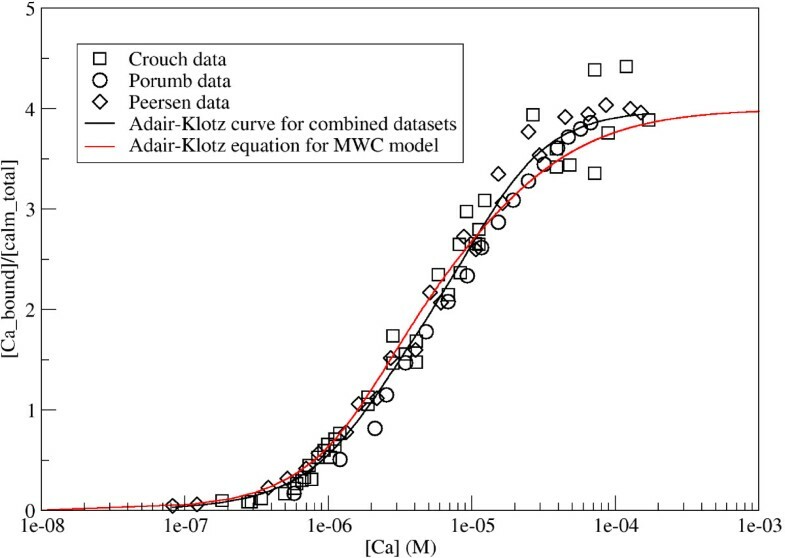 In order to compare the numerical outcomes of their models with experimental results, modellers using either the original or the generalised MWC framework need a way of converting microscopic MWC constants into observed Adair-Klotz constants. Here, we derive equations that can be used to compute Adair-Klotz constants and apply them to two special cases of the generalised MWC model presented here. Note that in the case of four identical binding sites, and , and the above expressions reduce to conversion equations for identical binding sites reported by Edelstein . with and as defined above. In the next section, we will consider two proteins with four binding sites each, which constitute extreme cases: In the case of calmodulin, all binding sites are different, so the protein can be seen as having four sub-groups of binding sites containing one binding site each (m1 = m2 = m3 = m4 = 1). In the case of hemoglobin, all binding sites are equivalent, so there is only one sub-group of binding sites containing four elements. To illustrate the practical relevance of these conversion equations we applied them to a previously proposed MWC model of calmodulin . According to this model, calmodulin can exist in two different states, R (that corresponds to the open state, stabilised by binding of calcium) and T (that correspond to the closed, often mistakenly called "apo", state). Each of these states can bind four calcium ions. The four different binding sites were designated A, B, C, and D (A and B on the N-terminal domain, C and D on the C-terminal domain, with no sequential order being implied within the domains). Each of the states and each of the reactions was explicitly modelled, with distinct dissociation constants for each of the sites. The dissociation constants for the R state were = 8.32 × 10- 6 M, = 1.66 × 10- 8 M, = 1.74 × 10- 5 M, and = 1.45 × 10- 8M. According to this model, L = 20670, and c = 0.00396 for all four binding sites . The calmodulin concentration used for the model was 2 × 107 M , and simulations were run using COPASI . When the fractional occupancy of calmodulin is plotted against initial free calcium concentration, simulation outcomes seem to agree quite well with experimental observations , but such a plot does not provide a direct way of quantifying this agreement. To do this, we inserted the parameters of the MWC model into equations 8 to 11 to obtain Adair-Klotz constants. These can be compared to Adair-Klotz constants previously obtained in experimental studies [10–14], as listed in Table 1. This comparison shows that all four Adair-Klotz constants computed from the general MWC model lie within the experimentally reported range, and thus show that the MWC model is indeed consistent with experimental data. Apparent Adair-Klotz constants (in M) for the calmodulin model as computed with our method, and comparison to several experimental reports [10–14] and data reviews . Figure 1 visualises this comparison: The Adair-Klotz curve obtained from the MWC model is compared to experimental measurements done by Porumb , Crouch and Klee , and Peersen et al. and to an Adair-Klotz fit to the combination of all three data sets. The plot illustrates that the Adair curve obtained from the parameters of the generalised MWC model presented here is similar to that obtained from experimental data, and that computing an Adair-Klotz function from the parameters of a MWC model does indeed provide a way of comparing an allosteric model to experimental measurements. Comparison of the calmodulin model with experimental data. Red curve shows the Adair-Klotz equation using the Adair-Klotz constants obtained from the MWC model of calmodulin. Symbols are used to represent data points from various experimental measurements of calmodulin binding to calcium: Circles for Porumb , squares for Crouch and Klee , diamonds for Peersen et al. . The black line represents a fit of all of these data set to the Adair-Klotz equation, which was obtained using the "Non-linear curve-fitting" function in grace http://plasma-gate.weizmann.ac.il/Grace/. Yonetani et al. fitted the same data for hemoglobin binding to oxygen once using the MWC framework and once using the Adair-Klotz framework. This study provides an excellent opportunity to test the validity of the conversion equations presented here: By using the results of their MWC fit and inserting K R , K T , and L into the equations presented in , we get an independent determination of the Adair-Klotz constants K1 to K4. Table 2 compares the Adair-Klotz constants thus obtained to the Adair-Klotz constants obtained by Yonetani et al. . Both methods yield essentially the same results, slight differences are presumably due to rounding errors and/or to limitations of the data fitting algorithms used, as well as possible over-fitting in the case of the Adair-Klotz framework. Experimental and theoretical determination of Adair-Klotz constants (in torr-1) from MWC constants at pH 7.0. K R = 3.0 × 10-2torr-1, K T = 7.0 × 10-3 torr-1, and L = 33, as obtained by Yonetani et al. by fitting data with an MWC equation . We used these to compute K1 to K4 using the equations presented in  and here compare them to K1 to K4 obtained by Yonetani et al. by fitting the same data with an Adair-Klotz equation . Note that Yonetani et al. used a slightly modified version of the Adair-Klotz equation, meaning that K1 in  corresponds to K1 in , K2 in  to K2 in , K3 in  to K3 in  and K4 in  to 4K4 in . To allow easier comparability, we used Yonetani's notation for this table and labelled the constants , ..., to avoid confusion with the original Klotz notation used everywhere else in this paper. The generalised MWC model proposed here opens up new ways of applying the allosteric framework: Not only to multimers consisting of identical subunits with one ligand binding site on each, but also to proteins with several binding sites of different affinities for the same ligand, be it multimers with more than one binding site on each subunit or monomeric proteins containing several binding sites. This framework has been used for an allosteric model of calmodulin , and could be useful in the analysis of a wide range of other proteins. The case in which binding sites for a given ligand can be grouped into sets of same affinity is straight-forward, as is the computation of fractional occupancy, R.
Najdi et al. have proposed a generalised MWC (GMWC) model for a protein binding to several ligand types and regulated by multiple allosteric activators or inhibitors. This model can be combined with the model presented here by replacing the term that denotes substrate concentration and affinity for each ligand in  by the appropriate sum: in the notation employed by , this would mean replacing by for each ligand. Such a combined model could then cater for proteins that bind to several ligand types (with non-identical binding sites per ligand) and that are regulated by multiple allosteric activators or inhibitors. In biology, the same question can be tackled at different levels and with different approaches, often based on different underlying theoretical framework. These approaches, however, need to be comparable to allow for cross-validation and for the assembly of different types of data into a comprehensive understanding of a given process. For instance, computational modellers need a way of comparing their models with experimental results to assess the validity of their models. In particular, mechanistic models need to be comparable to data or to the phenomenological models describing them. We offer a way of relating intrinsic association constants in allosteric models to Adair-Klotz constants and thus to bridge the gap between generalised allosteric models and experimental observations. Apart from enabling modellers to validate their models – as shown here in the two example cases – these conversion equations could also help in model construction by providing ways to constrain parameter space and facilitate the estimation of allosteric parameters, which is very useful in cases where there is little or no additional experimental evidence that could help with their derivation. MIS designed the generalised MWC framework and wrote the conversion equations with the help of SJE. All authors contributed to the manuscript. All authors read and approved the final manuscript.